Denver all Day Fest — Cool Ghoul Ltd.
D.A.D. Fest or "Denver all Day Fest" started in 2014 when we booked a show with too many bands so I decided to call it a fest. Then it evolved into a once a year thing where I bring a bunch of local denver bands together and make everyone get along for just one day. It's truly just a celebration of friendship, music, and what makes our city great. To purchase a discount fest ticket for 2017's dadfest show up between 1:00 and 5 p.m. on the day of the show at Mutiny information cafe and we will have them there for you. Early bird discount passes Limited to 100. We have had a few touring bands in the past (Celeste, Christworm, Nunhex, Plack Blague), but generally this is a locals only event. We will consider all submissions to play the fest starting 2018 from local & national acts. 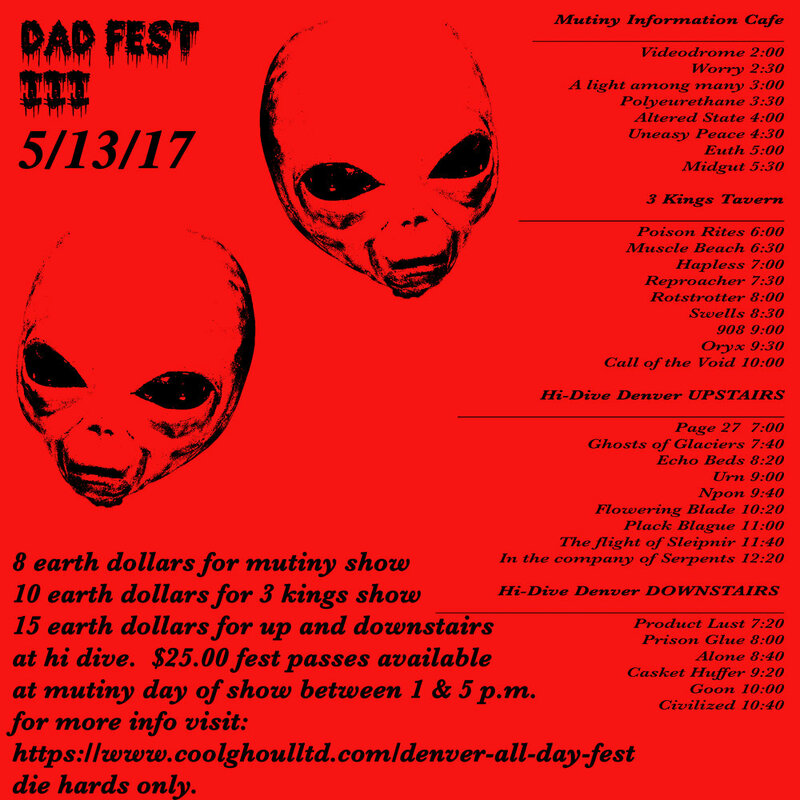 If you are interested in submitting your band for DAD Fest 2018 (Denver local or not) or if you have any related questions please email mankindbooking@outlook.com with DADFEST as the subject. Please include a link to your music or a summary of your inquiry. Thank you. All content is original and under license by the owner unless specified otherwise.